Spending time with my family is the best Mother's Day gift that I could receive. My sons are grown and no longer live at home so it's wonderful to have them all to myself for the whole day. This Mother’s Day Family Night In giveaway includes a $25 gift card to amazon.com to order a movie or two of your choice, along with free coupons from your favorite Nestle brands like Stouffer’s, Toll House Refrigerated Cookie Dough, Toll House Morsels, Nesquik, Ovaltine, Coffee-Mate, Wonka Exceptionals and Juicy Juice; as well as product from Raisinets and Wonka, with a $1.00 Wonka coupon and a 30-day Glowelle kit. 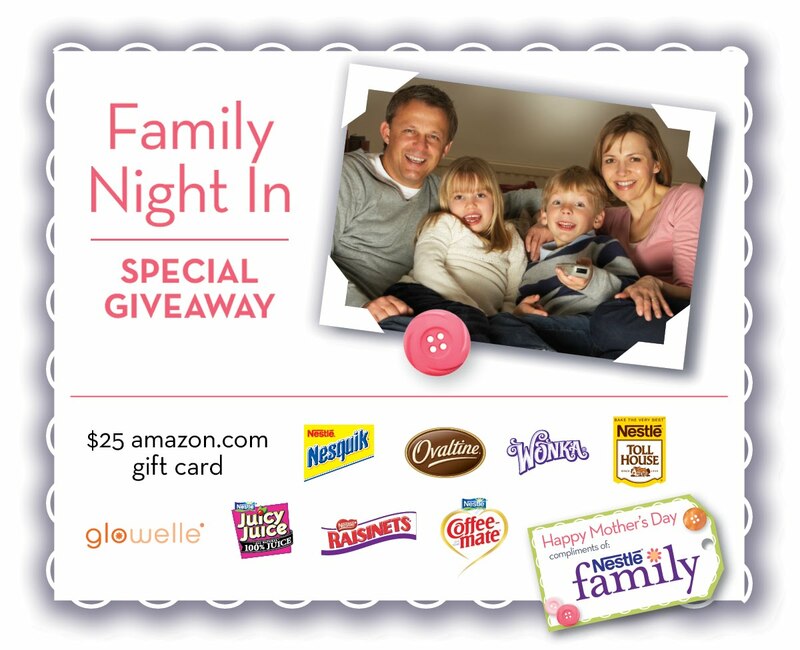 Don't forget to enter Nestle's Mother’s Day to Remember Sweepstakes to enter for a chance to win a $10,000 dream prize package. Disclosure: I will receive a coupon package similar to the prize in exchange for hosting this giveaway. To enter, please comment on this post with your favorite way to be appreciated or to appreciate your mom. Entries will be accepted through May 19th and I'll pick the winner using Random.org. US readers are eligible. We always try to do something special for my mom. A big night out someplace special for dinner and maybe a show. We take are mom out shopping for a new outfit and take her out to eat at her favorite plac. Myfavorite way is to get to sleep in and have someone make me breakfast-like today! Spending quality time together is the best! Today I cooked lunch for her and then we bought and planted veggie plants in the garden. Just a simple thank you or I Love you, is good enough for me! I am always sure the kids make her something. Handmade gifts from the grandkids are better than anything, if you ask my mom. Makes it easy for me, cause the kids LOVE making her things! I am blessed with a wonderful husband and two delightful sons! bed, roses, cards and the day is mine to do as I please. I like my boys to recognize that the house only keeps going because of me, so doing laundry or the dishes for mom is greatly appreciated. I always take my mom out to dinner..and I love when my hubby and daughter take me out too! I show my appreciation to my mom by taking her somewhere nice to eat.